It’s easy to joke about losing our hearing as we get older. “Speak up for grandpa over there” or “Jeez, should we get you a hearing aid?” may be funny jokes we use when speaking with friends, but the real side effects of hearing loss are less than amusing. New studies are starting to emerge which could change the way we think about hearing loss—less as a natural part of aging and more accurately as a harbinger of worse age-related diseases to come. This week, we’re looking into the science to find out how hearing loss has been shown to be an indicator of worse issues in many older people. While hearing loss can happen at any time, age-related hearing loss is the slow deterioration of an individual’s hearing over time. Approximately one in three older adults ages 65-74 suffers from hearing loss according to the U.S. Department of Health and Human Services. Because links between hearing and overall health are beginning to surface, finding new ways to slow or stop hearing loss could deter more damning medical issues in future generations. What Can Hearing Loss Lead To? A study published in the Journal of the American Medical Association (JAMA) on Nov. 8, 2018 sought to discover the association between a diagnosis of hearing loss and other medical comorbidities (the presence of two or more chronic illnesses in one person) aged 50 and older. 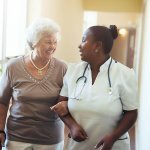 It found that while hearing loss is independent from other diagnoses, it was also “significantly associated with an increased 10-year risk of dementia, depression, falls, and myocardial infarction.” It concluded that further studies would be needed to understand why these associations take place and determine if hearing loss treatment could mitigate the prevalence of dementia and other issues in older patients. Another JAMA study found that untreated hearing loss may contribute to higher health care costs. Among the 4,728 adults studied, “untreated hearing loss was associated with $22,434 or 46% higher total health care costs over a 10-year period” when compared with individuals without hearing loss. A New York Times Dec. 31, 2018 article titled “Hearing Loss Threatens Mind, Life and Limb” interviewed Dr. Jennifer A. Deal. The epidemiologist and gerontologist at the Johns Hopkins Bloomberg School of Public Health and co-author of both aforementioned JAMA studies had a few theories about the links between hearing loss and dementia, falls and cardiovascular disease. First, she stated that hearing loss issues are not a matter of volume but of sound quality. The “garbled” (Dr. Deal’s word) messages the brain receives are harder for the brain to understand, and since the brain has a hard time focusing as it works to decipher auditory signals, it has a harder time committing the message to memory. This lack of proper communication could contribute to the increased cases of dementia. As for the increased risk of falls, a person’s inner ear is crucial to their balance, so that might be a factor. Additionally, those with hearing loss may be less aware of the sounds around them and, therefore, more easily startled and less able to adapt than someone who hears well. Dr. Deal noted she and her co-authors were most surprised at the link between cardiovascular disease and hearing loss. She postulated that the social isolation common to those with poor hearing could lead to extra stress but noted that it could simply be attributed to an overall prevalence of cardiovascular disease in both individuals with and without hearing loss. Another way to slow the onset of hearing loss is to stay socially engaged. Social isolation was a recurring theme across the studies and the Times article, as individuals suffering hearing loss may not engage in conversation as readily as those with without. So, staying engaged in a strong community of friends and family could slow the onset of hearing loss. Talk to a doctor if you or an older loved one is having a hard time engaging with conversations or understanding people when they speak. Other indicators an individual may be suffering from hearing loss include having trouble with telephone conversations, turning up the television or radio to louder than necessary levels, becoming easily frustrated during conversation and saying “what” multiple times in conversation. Keep up on information related to aging, the elderly and assisted living by following the Waterford’s blog. If you or someone you know is suffering from hearing loss and looking for an assisted living facility to help ease the pressures of living alone, call the Waterford today to talk about care options.